Creationism affirms that God created all things, including life ex nihilo, meaning out of nothing. Creationists see God's creative acts sequentially recorded in the first two chapters of Genesis. Creationism is opposed to atheistic evolution, which purports that matter is eternally self-subsisting. Atheistic materialists fail to see that if matter answers the question of its own existence then it would be, by definition, God. Creationism isn't married to biblical fundamentalism, claiming Scripture has God creating everything almost instantaneously in six 24-hour days, or just 144 hours. According to Jewish tradition, Moses wrote the book of Genesis and used the Hebrew word yom for "day." Back then, as now, the word "day" can mean a 24-hour period or billions of years, as noted in traditional catechisms. Biblical fundamentalists ignore solar and geological data showing that stars predated life forms and prehistoric species predated man. Genesis does present a sequence of divine creative acts starting with Genesis 1:3, which reads, "And God said: 'Be light made.' And light was made." Pope Pius XII personally believed this act of creation occurring on the "first day" alluded to the so-called Big Bang Theory. The remaining five days of creation, that possibly lasted millions of years, describe God overseeing the formation of inorganic matter and adorning earth with living species in stepwise fashion that makes scientific sense. Gradual creation not only makes scientific sense but it also makes good theological sense by upholding the principle that God wouldn't multiply miracles without necessity. Creating a species from nothing is miraculous, meaning it's above nature to accomplish. Creating a food chain, for instance, requires either creating several guppies at once or making a few guppies and letting them multiply naturally before making larger fish to eat them. God can do things naturally by creating species gradually over time and allowing nature to take its course, instead of rushing to create everything in six 24-hour days. 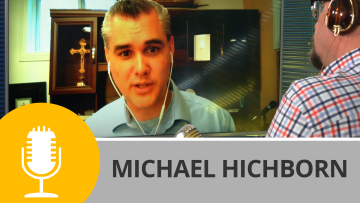 Find out what St. Thomas said about creation in season two of Church Militant's Premium show Right Reason—St Thomas, The Summa Theologica and Creation.